Travel through the history of Acapulco and discover the relevance Acapulco had in Mexico's history. 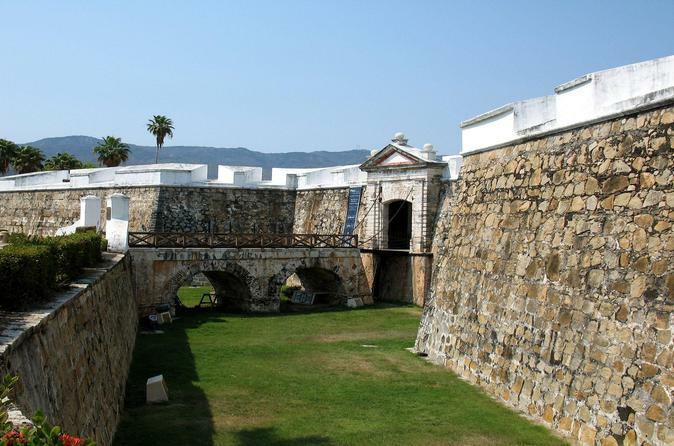 A visit to the fortress will take you back to the battles between corsairs and the Mexican army. See the Cathedral of Acapulco just right in the heart of the city and go back in time on your visit to the Flamingos hotel which once was owned for the famous Hollywood actor Johnny Weismuller when interpreting Tarzan. Enjoy the world wide famous cliff divers show and a stop at Diego Rivera´s Mural. Your tour guide will pick you up at the lobby of your hotel or port and your journey thru the history will begin. The first stop will be San Diego Fortress, a silent witness of the time passed and the history. Each of the chambers tells different episodes of Mexico´s history, since the first civilizations that settled in the area, the battles with the corsairs, the glamorous days of La Nao de China, the evangelization of natives, the battle for the Independence and Revolution. All of these Mexican history chapters are in one monumental fortress. Acapulco embraced prominent personalities who made of the city their own home such as Johnny Weismuller, Tarzan whom owned a property located at the highest cliff of Acapulco. Eventually this place became Los Flamingos Hotel but still keeps its history and fame as the house of Tarzan. You will get to see this place during your tour with a Hall of fame to visit and lovely point in the history of Acapulco. During the pass of time the world turned its eyes to Acapulco due to the famous show of the Cliff Divers at La Quebrada, brave men who risk to their lives to offer you an incredible performance.You'll also enjoy this wonderful show before returning to your hotel.